Born Sep 24 18831,2,3,4,5,6 [Sep - 18847], near Garden City, Hardin County, Iowa1,2,3,4,5,6. Wilfred H. Rash, born Aug 31 1906; married Veneta Whitmore. Rash, Clifford, head-of-household, age 37, born in Iowa; father born in North Carolina; mother born in Indiana; rented home; occupation: farmer. Rash, Lake, wife, age 36, born in Iowa; parents born in Iowa. Rash, Wilfred, son, age 13, born in Iowa; parents born in Iowa; attended school. Rash, Frances, daughter, age 11, born in Iowa; parents born in Iowa; attended school. Rash, Lester, son, age 3, born in Iowa; parents born in Iowa. Rash, Clifford, head-of-household, age 48, born in Iowa; father born in Tennessee; mother born in Iowa; first married at age 22; rented home ($10 rent); no radio in home; occupation: farmer, grain farm; not a veteran. Rash, Lake, wife, age 46, born in Iowa; parents born in Iowa; first married at age 21. Rash, Wilferd H., son, age 23, born in Iowa; parents born in Iowa; first married at age 23; occupation: agent, depot; not a veteran. Rash, Hazel I., daughter-in-law, age 16, born in Iowa; parents born in Missouri; first married at age 16. Rash, Francis A., daughter, age 21, born in Iowa [unclear]; parents born in Iowa; occupation: servant, private home. Rash, Lester R., son, age 13, born in Iowa; parents born in Iowa; attended school. 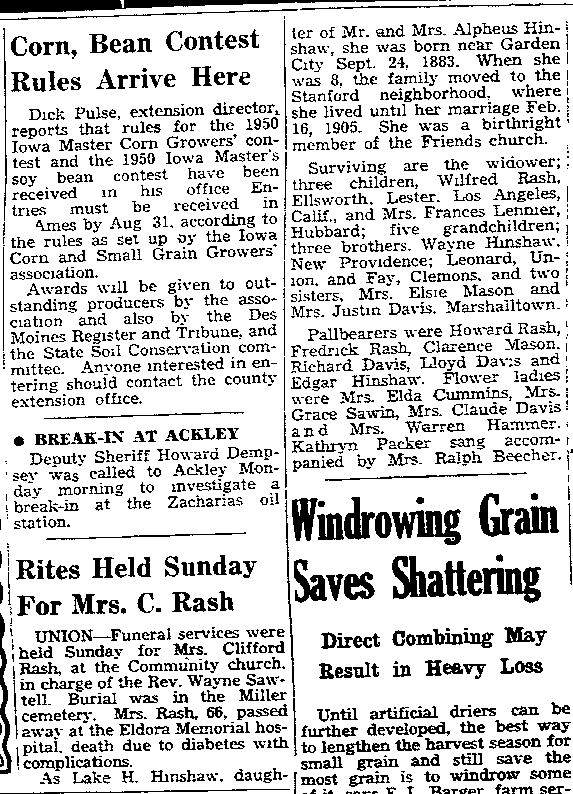 Lake's obituary was published in "The Eldora Herald-Ledger" (Eldora, Iowa) on Tuesday, July 11 19506 (see scan below). Clifford died Sep - 19652,10 [Aug - 196511]; buried Union Township, Hardin County, Iowa2,10. 1920 census, Scott Township, Floyd County, Iowa; roll T625-490, ED 123, page 5A, line #2, dwelling #79, family #79. 1930 census, Bangor Township, Marshall County, Iowa; roll T626-668, ED 1, page 5A, line #30, dwelling #116, family #116. Eldora Herald-Ledger (Eldora, Iowa), Jul 11 1950; http://www.ancestry.com. Contribution from Gregory W. Rash (). 1930 census, Bangor Township, Marshall County, Iowa; roll T626-668, ED 1, page 5A, line #26, dwelling #115, family #115. 1930 census, Bangor Township, Marshall County, Iowa; roll T626-668, ED 1, page 5A, line #20, dwelling #114, family #114. Photos courtesy of Gregory W. Rash ().